This is the magnificent motor car that makes the most of country living and town travel. 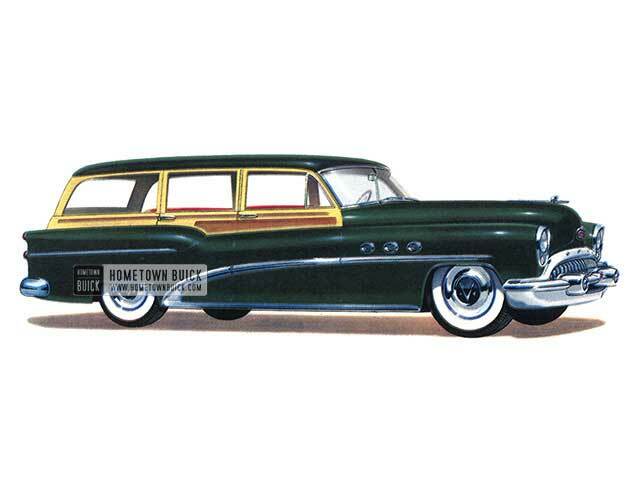 So versatile is the 1953 Buick Roadmaster Estate Wagon (Model 79R), it is always at home with those who combine city life with suburban settings. It's perfectly at ease with casual clothes and the activities they fit - equally so at white-tie-and-tails affairs.Seasoned wood and sturdy metal dress this handsome carrier of six big people and all their gear or luggage. The Roxpoint nylon carpeted rear platform stretches more than six feet from front to back, almost five feet from side to side, when the rear seat is folded. 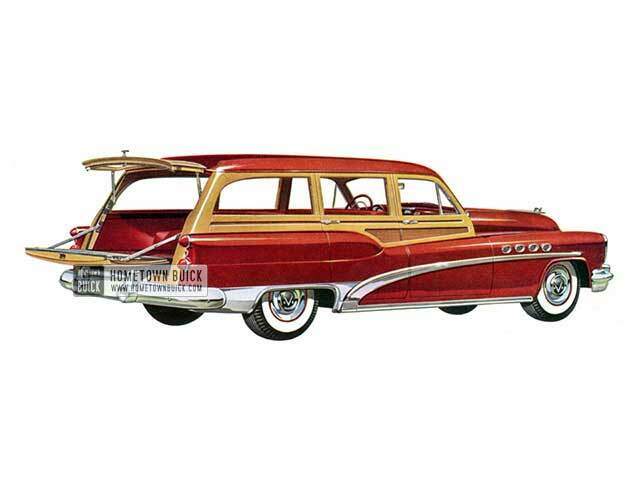 In limited production, the Buick Estate Wagon is available on either the Super or the Roadmaster chassis. In this corsair of the highway you live a motoring life like nothing you ever knew before-feel joyously free as the winged creature that gave its name to this Buick. 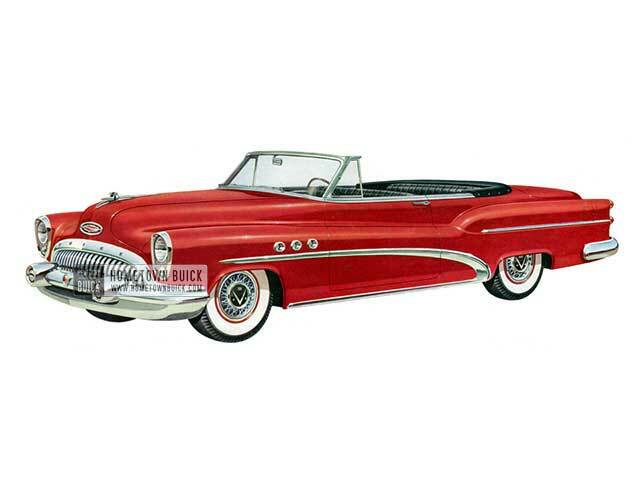 The 1953 Buick Skylark Convertible (Model 76X) is styled for those whose motoring tastes call for extra flair, whose choice runs to slick beauty and rakish lines. Note the chrome plated wire wheels, each with 40 individual wire spokes. With the top up, the Skylark stands less than five feet high, luxuriously fitted with soft-tanned choice cowhide available in four handsome color combinations. This modern American sports car is in strictly limited production. On the Roadmaster chassis of 121 1/2-inch wheelbase, it has the phenomenal performance of the 188-horsepower V-8 Fireball Engine combined with Airpower carburetion, an 8.5 to 1 compression ratio, zeroback-pressure muffler, and the sensational new Twin-Turbine Dynaflow Drive. Added to these features as standard equipment, Skylark also has Power Brakes, Power Steering, Easy-Eye Glass, Selectronic Radio with electrically operated telescopic antenna, and white sidewall tires. 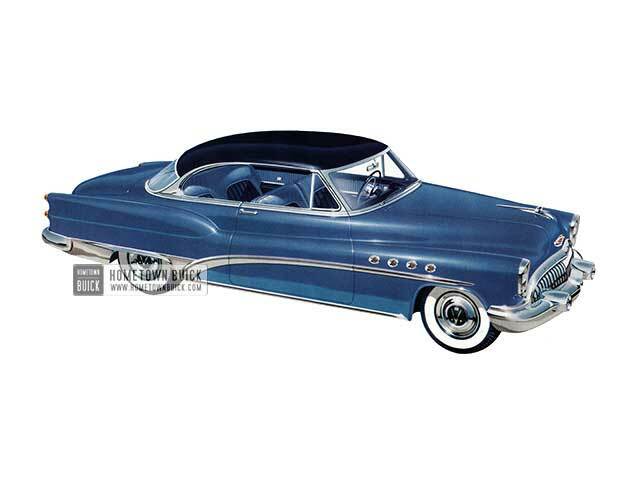 Superbly styled for 1953, this two-door Roadmaster Riviera, king of Buick's ‘hardtop’ line, boasts a host of engineering advancements topped by a 188-horsepower valve-in-head V -8 engine, a new Twin Turbine Dynaflow and power brakes that take 75 per cent of the effort out of braking. 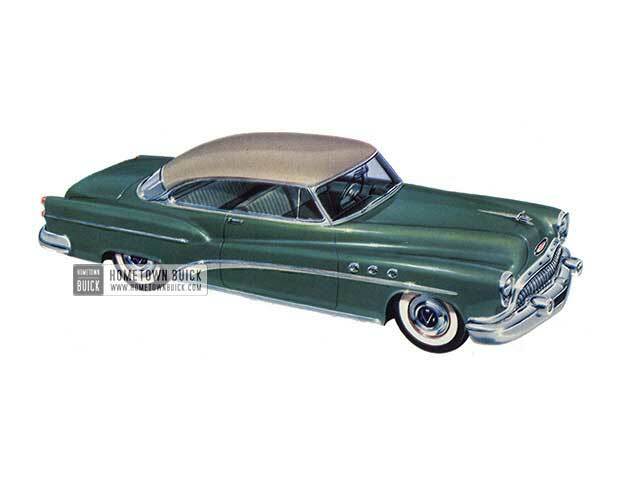 New styling features include a new front end, and new headlamps and new rear fenders modeled after Buick's XP-300, and wire wheel covers, which are optional on all 1953 models. 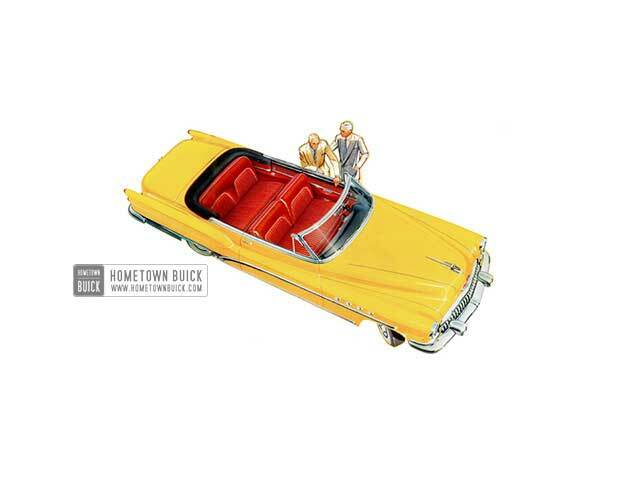 The long, low look and sweeping lines of the Golden Anniversary Roadmaster are fully evident in this view of the Convertible model. You make the most of any season, any weather, in this airy beauty. Hydraulic controls position the top and the windows where you want them, and adjust the front seat to your liking. Combined ‘slide-away,’ ‘tilt-away’ feature of front seat permits far easier access to rear compartment. The best way to judge any automobile is out on the road, and that’s where we hope you will be - in this Golden Anniversary Buick, the 1953 Buick Super Estate Wagon (Model 59) soon. We have drawn upon 50 years of experience in building great automobiles to give you this finest of all that have gone before. We have come up with scores of improvements and refinements - from the front bumper designs and headlamp styling - to the first zero-power-loss muffler The next move is up to you! 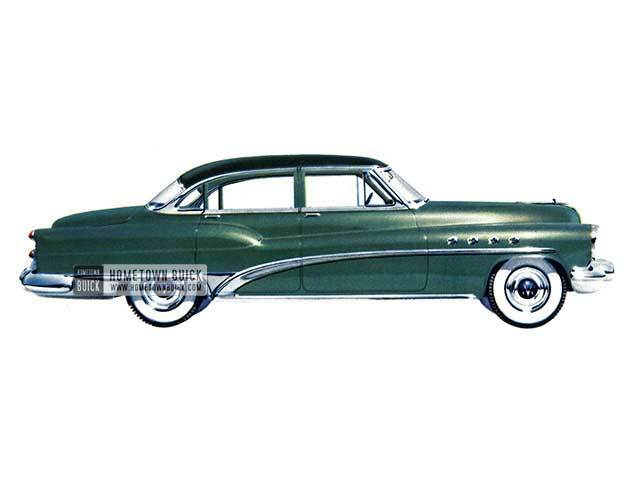 The distinctive Buick styling is evidenced in the 1953 Buick Super Riviera (Model 56R), one of the most popular models in the entire Buick line. 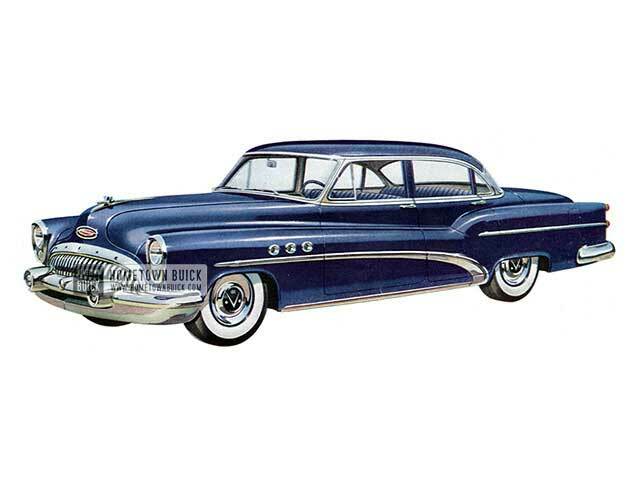 Buick's Super for 1953 is powered by a 170-horsepower 90° valve-in-head V-8 engine of new design, hooked up to a new twin turbine Dynaflow to give the ultimate in performance, smoothness and economy. Wire wheel covers are optional equipment on all models. A bulls-eye winner in the smart convertible class for 1953 is the 1953 Buick Super Convertible – Model 56C. Completely new in every respect, the Super convertible has a powerful new V-8 engine and a new Twin Turbine Dynaflow transmission which give it sensational new performance and improved economy. Exterior styling is freshly new from the redesigned front end to the futuristic rear fenders. Power steering and wire wheel covers are available as optional equipment. The 1953 Buick Special Deluxe Sedan (Model 48D) has wider front seats for even more room, with tilt-away front seats for easier entrance and exit. Big thrill for the budget minded. In this sleek and stunning Buick Convertible is happy news for a lot of people. 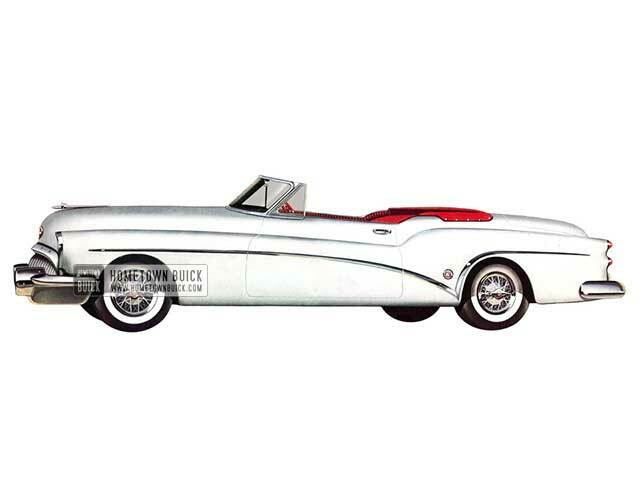 For this one - now back in production - is a Buick Special. Which means it's thoroughbred Buick through and through - but priced to crowd the ‘low-priced three.’ It delivers for just a few dollars more than such Convertible models-yet there the similarity ends. In motion, this swift-lined beauty is pure thrill. Sleek beauty cloaks the sensational performance of the popular Riviera. This big, beautiful, budget-priced 1953 Buick Special Riviera (Model 45R) is a feast to your eyes. All the swift, clean lines of Buick's Golden Anniversary styling are here. 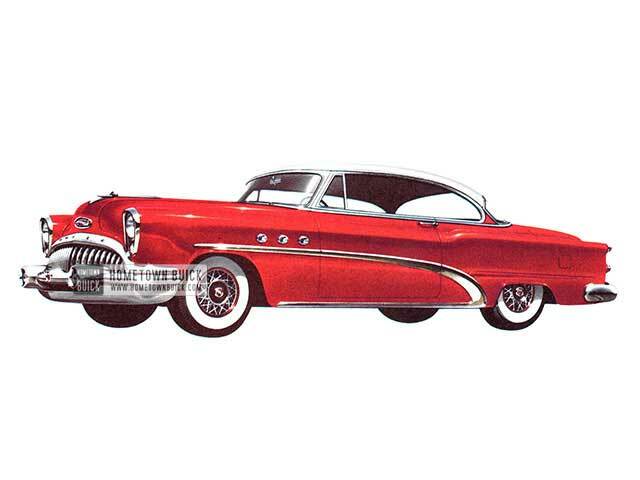 Superb styling, the world's newest V-8 engine, a stepped-up transmission and power steering combine to make the lordly 1953 Buick Roadmaster Sedan (Model 72R) peerless in the luxury car class for 1953. Its powerful V-8 provides 188 horsepower with a compression ratio of 8-1/2 to 1. Its new Twin Turbine Dynaflow gives sharply increased performance, better economy and smooth acceleration.Styling developments include an entirely new front end, redesigned rear fenders, new moldings and ornaments, and a bright new combination of colors and interior trims. Offered as optional equipment on this Golden Anniversary model are air conditioning, power brakes and wire wheel covers. 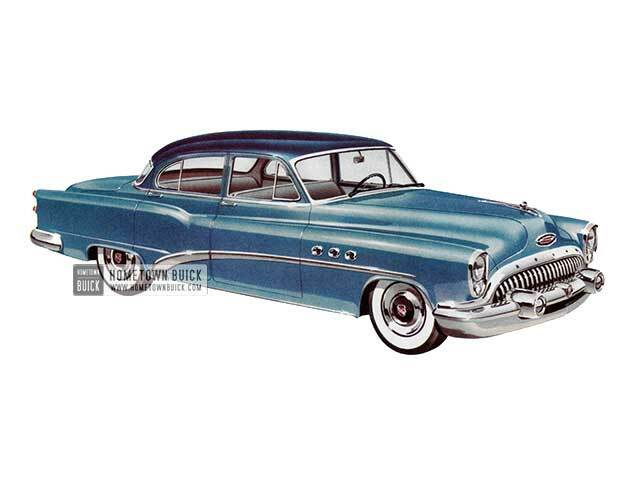 The 1953 Buick Super Sedan (Model 52) can set you atingle with thrill. 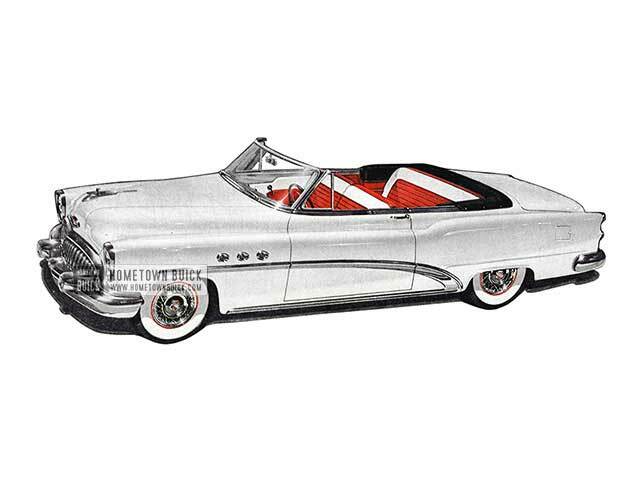 It can move from zero to legal speed quicker and quieter than any Buick before it - and with the utter smoothness of a gull in glide - because this is a 1953 Buick Super Sedan with the getaway of Twin-Turbine Dynaflow. I can surround you with comfort, beauty, restful ease. Here is a car of striking beauty and outstanding performance. 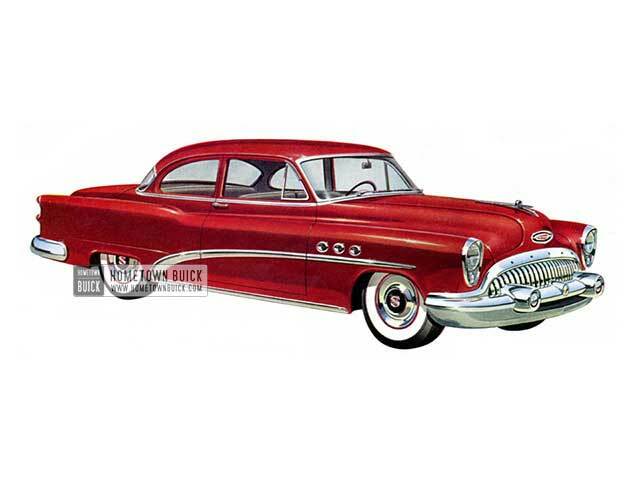 Here in the 1953 Buick Special Sedan – Model 41D, you have a newly designed Fireball straight-eight valve-in-head engine of high compression now offering the highest horsepower in its history.